What does it mean for God to ordain all things that come to pass? That is frustratingly difficult to answer. The word “ordain” carries the meaning of “to decree, “to set (something) that will continue in a certain order”. How God ordains all things is closely related to how one understands God’s sovereignty. There are 4 major models (outlined in this Parchment & Pen post), describing different ways in which God may exercise His sovereignty. Understanding which model of God’s sovereignty is being described in various Reformed creeds and writings can be a challenge as numerous terms (ordain, decree, determine, author, permit, predestine) are used, often without a clear definition of what is meant by each term, or how these different terms relate to each other. Adding to the challenge, different people within the Reformed movement hold to different models of sovereignty. we hold that God is the disposer and ruler of all things, that from the remotest eternity, according to his own wisdom, he decreed what he was to do, and now by his power executes what he decreed. Hence we maintain, that by his providence, not heaven and earth and inanimate creatures only, but also the counsels and wills of men are so governed as to move exactly in the course which he has destined. For Calvin, God does not foreknow the future, instead God decrees that something will come to pass and by virtue of that decree, the event becomes necessary and is certain to occur (Institutes III.23.6). he foresees the things which are to happen, simply because he has decreed that they are so to happen. Let us suppose, for example, that a merchant, after entering a forest in company with trust-worthy individuals, imprudently strays from his companions and wanders bewildered till he falls into a den of robbers and is murdered. His death was not only foreseen by the eye of God, but had been fixed by his decree. Whatever God ordains, must be; but the wisdom of God never ordains anything without a purpose. Everything in this world is working for some great end. If God ordains all things then is God responsible for the evil that occurs? yet so, as thereby neither is God the author of sin, nor is violence offered to the will of the creatures; nor is the liberty or contingency of second causes taken away, but rather established. 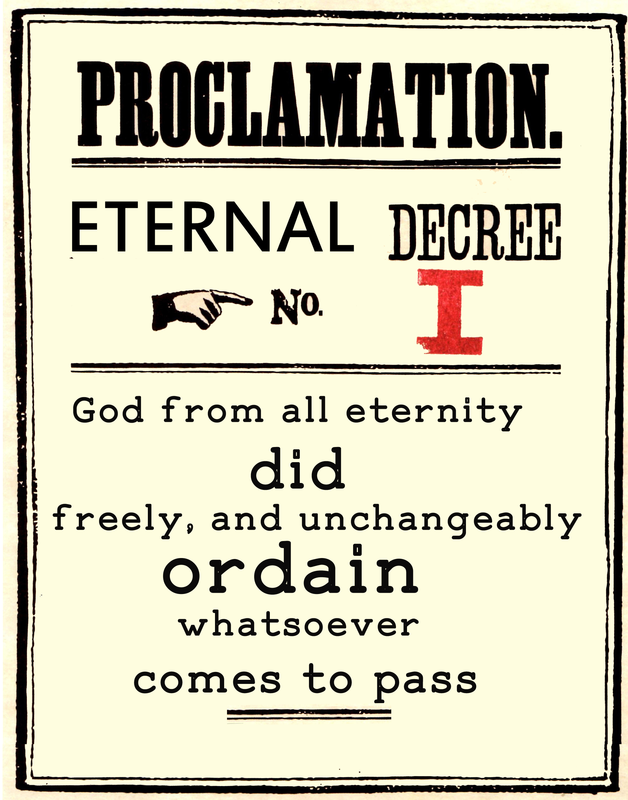 If “all things that come to pass” are a result of God’s eternal decree then on what basis does the Westminster Confession seek to exclude sin from those things that God is directly responsible for? If God ordains all things and is thus the ultimate cause and source of all that happens than in what way is He not the author of sin? How should we understand the term “author” and how does it differ from “ordain”? In this quote we see the terms “willing” sin into existence, “permission”, and “author” in respect to sin. The key for distinguishing the terms “ordain” (or decree) from “author” according to the Reformed view is agency. Edwards sees God as permitting sin (negative agency) through His eternal decree but not actually committing sin (positive agency). Consider the merchant example that Calvin used. God, through His eternal decree, makes the murder of the merchant necessary and certain by ordaining that it should happen. In this sense He would be the ultimate or primary cause. However, God is not considered the author of the sin because the thieves committed the crime (they are secondary causes). But several important questions arise from this. How did God insure that His decree would be fulfilled? In what way did He influence or control His creation so that His will and plan was accomplished? In short why did the thieves commit this crime? It would be right to conclude that the thieves acted according to their will. But how did God know that the thieves would have the desire to murder the merchant and thus fulfill His plan? We might be tempted to say God foreknew what they these men would will and do. Knowing this in advance God permitted the thieves (negative agency) to act according to His plan and according to their will resulting in the murder the merchant. The actions of free agents do not take place because they are foreseen, but they are foreseen because they are certain to take place. If God knows all that will occur, not by foresight but because of His decrees, then He could not know what the thieves would desire to do unless His plan included His acting in some way to insure the event occurs. For most Reformers, including Calvin, the “wills of men” are also decreed (planned and set in order) by God. The thieves may have murdered the merchant, acting based on their will, but God decreed their greedy and murderous will thus insuring that His plan would be fulfilled. However, if God governs the wills of men so that they do what He has planned then this would make God a positive agent in the commission of the sin and thus responsible for more than permitting it to occur. If God’s decree did not govern the will of the thieves such that they would carry out His plan then that would mean their will was determined by something else. However, if that were the case that would make the death of the merchant a ‘man-centered’ choice, diminishing God’s sovereignty over all that He created because it makes man the final arbiter over what evil is or is not committed. This would again open up the possibility that God’s decreed plan would fail to be fulfilled. Does God decree all that comes to pass? Does God’s decree of an event necessitate that the event must occur? Does God know what will occur in the future because He decreed what will be or does He foresee future actions? Does God’s decree permit an event to take place or does the decree cause the event to take place? If the decree is permissive and not causal what insures that the decreed event actually takes place? Does God decree and govern the will of man (which is the basis for his actions)? If not what is the source of man’s will? How does God insure that man will perform the actions that He has decreed? As I read back through various Reformed creeds and authors and answered these questions as they might I can’t logically come to the conclusion that they do – that God has ordained all that comes to pass but is not responsible for the sin that is committed. Then I read this passage in 1 John 1:5 and realize that there must be another way to understand God’s sovereignty. Which is why I am not Reformed. This entry was posted in Theology and tagged challenging questions, determinism, election, soteriology by MikeB (@AnAgileJedi). Bookmark the permalink.